14th – 23rd December – 7:00 a.m. until 10:00 p.m.
Christmas Eve – 7:00 a.m. until 9:00 p.m.
Christmas Day – Closed – Merry Christmas! Your Christmas Feast just got much easier! 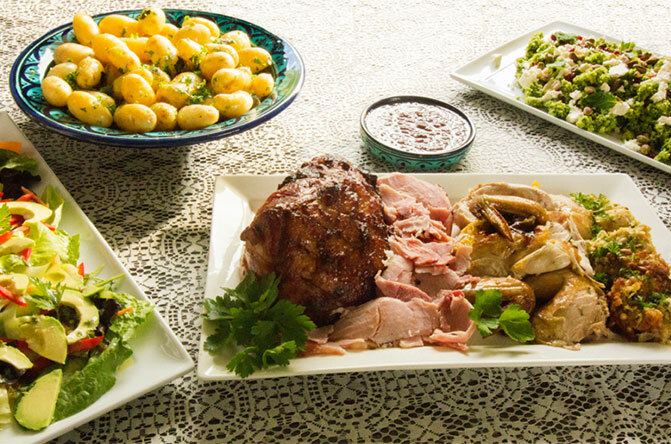 Enjoy a Starter, Ham, Chicken, 2 x Salads and a Dessert. When ordering more than one Food Basket and you have chosen to include liquor, please tell us in the box below how you would like the bottles distributed among the Baskets. If you have a preference for beer or wine you can let us know here too. When would you like to collect your Goodies Basket(s)?